​Racket Shreve, a Salem native, graduated from the Rhode Island School of Design in 1968 with a B.F.A. in Illustration. He served in the United States Army, not only as a field illustrator, but also as a graphic designer for the Deputy Joint Chiefs of Staff. Upon discharge and after extensive travel, Racket met with much success as a freelance illustrator in Boston. 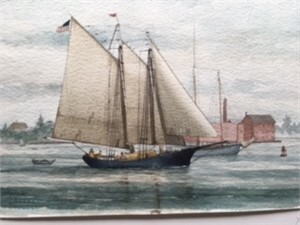 His work has been reproduced in Boston Magazine, Atlantic Monthly and Sail Magazine. He most recently illustrated Salem historian Jim McAllister’s book “Salem from Naumkeag to Witch City” and Raymond Bates Jr’s book “Shipwrecks North of Boston.” Racket’s work has focused mainly on maritime subject matter. His avid interest in small boat sailing and boat model restoration has contributed veracity to his technical talents as a marine painter. He has been sailing the North Shore waters for over 25 years and his work reflects a keen perception of it’s various traditional vessels and panoramas. Racket’s work has been selected to be included in many of Mystic Seaport’s annual juried international shows including 2006 and 2007 as well as many of Mystic Seaport’s exclusive Invitational Exhibits. As a top competitor in the1990 Massachuetts Duck Stamp Competition, Shreve’s detailed painting of a Golden Eye Hen Decoy was selected to be reproduced on the 1990 State stamp. Racket’s work has been seen on the Channel Two Auctions since 1974 and he has been a featured artist in the juried “Two Collection,” a special arts segment of the annual WGBH on-air auction, since its conception. Racket’s work has been accepted annually at the Marblehead Arts Festival since 1974 where he has won numerous awards in painting and drawing to including two honorable mentions in 2006, a “Best of Show” in 2007 and the Lee R. Smith Award in 2008. His one-man show in 2005 at the Arnould Gallery, Marblehead was a huge success. In 2007, Racket was asked by the Salem Maritime National Historic Site to design and create a Christmas tree ornament for display in The White House. His work hangs in many homes and private collections and institutions to include the United States Department of Defense, Department of the Interior, the Peabody Essex Museum and Forbes. View Racket Shreve's Painting on our online marketplace. Racket Shreve ​Racket Shreve, a Salem native, graduated from the Rhode Island School of Design in 1968 with a B.F.A. in Illustration. He served in the United States Army, not only as a field illustrator, but also as a graphic designer for the Deputy Joint Chiefs of Staff. Upon discharge and after extensive travel, Racket met with much success as a freelance illustrator in Boston. 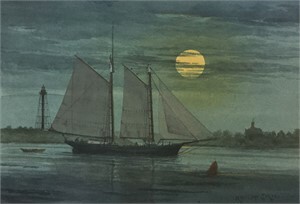 His work has been reproduced in Boston Magazine, Atlantic Monthly and Sail Magazine. He most recently illustrated Salem historian Jim McAllister’s book “Salem from Naumkeag to Witch City” and Raymond Bates Jr’s book “Shipwrecks North of Boston.” Racket’s work has focused mainly on maritime subject matter. His avid interest in small boat sailing and boat model restoration has contributed veracity to his technical talents as a marine painter. He has been sailing the North Shore waters for over 25 years and his work reflects a keen perception of it’s various traditional vessels and panoramas. 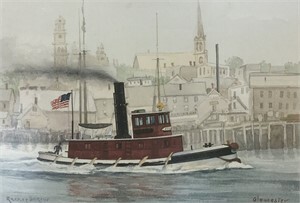 Racket’s work has been selected to be included in many of Mystic Seaport’s annual juried international shows including 2006 and 2007 as well as many of Mystic Seaport’s exclusive Invitational Exhibits. As a top competitor in the1990 Massachuetts Duck Stamp Competition, Shreve’s detailed painting of a Golden Eye Hen Decoy was selected to be reproduced on the 1990 State stamp. Racket’s work has been seen on the Channel Two Auctions since 1974 and he has been a featured artist in the juried “Two Collection,” a special arts segment of the annual WGBH on-air auction, since its conception. Racket’s work has been accepted annually at the Marblehead Arts Festival since 1974 where he has won numerous awards in painting and drawing to including two honorable mentions in 2006, a “Best of Show” in 2007 and the Lee R. Smith Award in 2008. His one-man show in 2005 at the Arnould Gallery, Marblehead was a huge success. In 2007, Racket was asked by the Salem Maritime National Historic Site to design and create a Christmas tree ornament for display in The White House. His work hangs in many homes and private collections and institutions to include the United States Department of Defense, Department of the Interior, the Peabody Essex Museum and Forbes. View Racket Shreve's Painting on our online marketplace.